Hi loves! Coming period you might notice some blogposts will have the "Christmas manicures" tag in front of them. I looooove Christmas and I'd like to show you some options for this season! Also, hopefully it triggers me to do some more unique manicures for you :). Today I am starting easy, and sometimes classics don't need anything other than the color it is now do they? 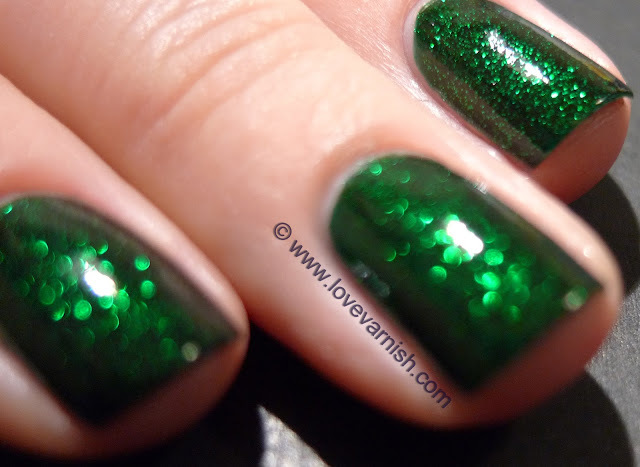 China Glaze Emerald Sparkle is one of the most famous polishes China Glaze ever did. 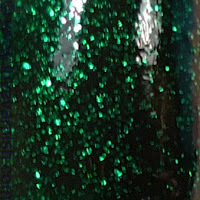 It is the green sibbling to Ruby Pumps, with its green jelly base and silver glitter that turns green because of the base color. They even apply the same to me, and both need 3 coats. So let's take a look at this sparkly green shall we? This is seriously the perfect evergreen green color! So pretty! I can't stop drooling, this just screams Christmas to me! Love it!! Oooo gorgeous! I've also been seeing that Emerald is the Pantone Color of the Year. This is perfect! I love this!!! It seems so hard to find sparkly polishes that just GLOW. Winner for me! Yum yum yum. I wish this was till available. Maybe they'll bring it back? I love this color so much! You show the sparkle really well. I have worn ChG Holly Jolly and loved it - but this yr I had to get this one - I was insane for it and needed it. Now with the Panatone shade for 2013 being emerald I am thinking I will wear these kind of greens more than just holiday and St. Patty's day! It really is! Every lacquerhead should own this one ♥. It does right? And it is the Pantone color of the year! Yup, it fits so well :). This has amazing depth because of the base that isn't to opaque :). Can you believe I only own one polish from that collection? I keep debating over getting Jolly Holly and Little Drummer Boy..